CSG Geotechnical Services is the geology and groundwater hydrology division of the Center for Sustainable Groundwater. We provide technical and consulting services in the areas of groundwater, geology and geophysics. Based in central Virginia, our service area is historically focused on the mid-Atlantic states but we seek opportunities elsewhere in the US and world-wide. We are committed to sustainable use and responsible stewardship of water, mineral and land resources. Where’s the best place to drill my well? 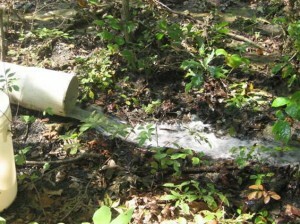 What’s the sustainable yield of my well? Is my well water safe to drink? Will we hit rock when we dig? Are there caves under this site? Are there valuable minerals on my property? The CGS Logo and CGS Geotechnical Services is copyright © 2010 Center for Sustainable Groundwater. All rights reserved.